British Rage Software's 2001 Hostile Waters' is a combination of real-time strategy and action gameplay. Its convoluted plot revolves around conflicts between the remains of the Old Guard - the vestiges of the self-interested power hungry opportunists of our era - and the people who have united against them. Then more things go south in a major way and you're left with one battle carrier equipped with nano-replicators (called creation engines) so you can change the composition of your army on the fly as you desperately struggle to prevent a total wipeout of humanity. 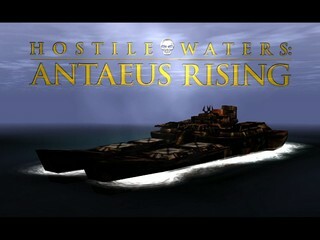 Hostile Waters: Antaeus Rising is a highly underappreciated game released in 2001 with glowing reviews but sadly it did not sell very well. It is a lot of fun to play, and was a lot of fun to speedrun too, although there are four levels with fixed timers. There is a decent amount of variety in the levels, there is no standard strategy that beats most of the game. There is one notable exploit I am aware of, the fact that during in-game cutscenes your units are invincible but can still move and shoot, you can even move and perform actions yourself. It seems the developers intended this in order to show your units looking cool, but didn't want the player to lose units to a cutscene. They balanced it by not having any abusable cutscenes in the last third of the game, but this still leaves numerous opportunities to win impossible fights. A lot of mission objectives do not need to be met at all. Notably, you get orders to destroy derricks on a lot of levels but the only Cabal controlled derricks you actually need to destroy are in the eastern base in mission 14. Cabal derricks don't actually produce much energy either, well not on a speed run anyway. The enemies that pour forth from factories are mostly funded from energy storage, which is a more worthwhile target. On entering the map screen, you will scroll from where you were on your last visit to the location of your currently selected unit. If you are on the other side of the map, this will take a second or two. You can reduce this by clicking ahead before leaving the map screen. I'm not terribly consistent with this but I do it sometimes. The best general purpose weapon is the scalpel (chaingun). It does not benefit from a recharge unit because it recharges ammo faster than it uses it, but even with recharge units the only weapon that beats it in terms of damage is the firestorm (flamethrower), which is not a good general purpose weapon. The double mounts on the shark and behemoth are purely cosmetic and do not affect damage output. The Arclite is extremely underrated. It fires slow moving projectiles, it doesn't fire very quickly and it only disables enemies temporarily. But it only needs one shot to disable something, and can disable a lot of turrets rather quickly. It is also cheap, unlike the Warhammer or Rapier, which is useful if you start poor and are in a hurry. Most Let's Players tend to build a few strong ground units. I need as many units as I can get to win quickly, and AI pathfinding is very bad on the ground, so I use lots of helicopters. Something often neglected is the quick order system. This allows you to give orders to your AI buddies with a few keystrokes. It is rarely seen in let's plays because you can give the same orders from the map screen, which pauses the game, but I want to avoid pausing. The quick order keys can also be used on the map screen, which makes issuing orders a lot faster than clicking everywhere. It's quite easy to miss when I give orders because I do them fast (obviously) and sometimes I do them while a cutscene is going, so listen for the interface beeping. You can recycle units by moving them onto a construction bay, entering the build screen and dragging them off the bay. This is instant, and yields the full value of the vehicle. You cannot recycle mission objectives this way. Scavenger duty! This is mainly about maneouvring so that you can start recycling the next bit of scrap as soon as you're done with the current piece. I managed to cut three seconds off my time by building my second Scarab at the start and hauling into the pier before Patton gets back with the Hornet. This means I don't need to use Ransom to break down the cranes, instead I go straight to the tanks that Borden is harvesting, saving her more time and ultimately getting 5500 EJ sooner. The first abuse of cutscene invulnerability. OverlordTM has a run of this level on Youtube, which is where I first found out about the trick. I made my hornets without armour so I could afford to not recycle them, making me even more dependent on cutscene invulnerability than he was. I also avoided the derricks and simplified the orders I gave on the map screen, requiring me to destroy the eastern radar tower manually. I set two waypoints on Antaeus' contruction bays in this level, which allows me to quickly order everyone back once the air factory goes down. Destroying the air factory is made easier by the fact that there is a spare fuel tanker. One must be careful not to destroy the dish before the communications have been intercepted, which fails the mission. This is a very dangerous strategy which usually ends up with my units getting killed by the alien AA towers. But if you focus fire on one tower at a time, and target them as soon as they appear, a fast time is possible. Once again I benefit a lot from cutscene invulnerability, though not against the alien towers. You may be wondering how I ordered Patton to pick up the salamander. If you press 'm' you can cycle through the mission objectives that are visible on your map. These target selection keys usually cycle through what you can see, but you can select targets on the other side of the map if other units can see them. This is a fixed time mission, lasting 8:20 in game time. Once the timer expires the mission will continue until all enemies are dead. Thank you OverlordTM for telling me about this strategy! My previous method involved a lot more time in the build screen. The method OverlordTM suggested was to build four Sentinels and just leave them on the creation pads, but this rarely worked when I tried it. Building Salamanders however, was a lot more reliable and also meant I did not have to scroll down in the build screen. Once again I am indebted to OverlordTM for suggesting the use of Antaeus' guns to kill the chopper pilot. This allowed me to kill him before sampling the laser and shortened my time by about two and a half minutes. It's a little tricky hitting the pilot without hitting the chopper, but well worth it. This is the biggest abuse of cutscene invulerability. The one real target in this mission is the shield generator in the cabal base, and two cutscenes are triggered by flying into the northern half of the map, allowing me to select the generator (press 'm'), order a salvo from antaeus and a direct attack from my hornets. There is no need to hide from the recon choppers. Discovering the missile silos will remove the stealth requirement, while the recon chopper will arrive late and only attack one Scarab at a time. I have improved over my previous strategy by carrying the tanker to the northern radar dome instead of the southern one. This reduces travel time and simplifies giving orders. I also bring the puma to the northern resource area, as the journey to the silos is a fair bit shorter. The game will not recognise your destruction of the radar domes until the missiles have launched, and the missiles are launched 100 seconds after you discover the silos, so discovering the silos early is important. Because there is a ridiculous number of anti air towers, I use Salamanders instead of choppers. Unfortunately, the AI pathfinding is terrible, especially on this island. Madsen gets stuck at the northern base, and only three of them manage to get to the command centre. And yes, this is my best run. The AI doesn't actually know how to navigate the central base, you have to show it how using waypoints. I also have to kill three tanks on the east side of the channel near the northern base, my units do not know how to deal with them. An easy way to do this mission is to use Antaeus' guns on the train control centre and send a few hornets toward the canister as a distraction while you haul it onto the track. After a few minutes, the second train will push the canister into the Cabal base and win you the mission. Despite the defenses around the base entrance and the mission objective to protect the canister, no Cabal forces ever try to destroy it. Fortunately, the speed run method is a bit more exciting. I have not found a way to get the canister on the track ahead of the first train, so I drag it along the track myself, straight into the Cabal base, using whatever hornets I have left to distract the defenses around the base entrance. This is in fact a fixed time mission. You cannot investigate the cold generators until Church tells you to, which happens after about five minutes twenty seconds, and everything else can be accomplished quite easily within that time. Thus, the key to a good time is minimising time spent on the map and build screens. Securing the base entrance means destroying the static defenses around it, and also destroying the tank that normally sits there. It is a good idea to get there as stealthily as possible, because the tank can get called out to respond to threats and may be hard to find if it is, which is what happened. Fortunately, it returned to its' post, allowing me to destroy it in good time. The communications centre and the bridge do not have to be destroyed. Since harvesting energy at the communications centre tends to be interrupted by a neverending stream of tanks, I harvest energy at the site north of the communications centre. I saved a few seconds over a run I posted on Youtube by not moving the rally point on the map screen and instead ordering my Scarab to drive there while the timer was running down. This mission starts with an unskippable cut scene, but since cutscenes in this game do not prevent movement, I can move forward and actually start shooting before it ends. It's a bit hard to aim, but I do some damage and more importantly get close. The secret to beating it quickly is to get up close. Its' first two phases miss a lot if you are right under its' feet and dodge around, and the homing missiles in the second phase usually go into the ground. The third phase is harder to dodge, but if you were dodging well in the first phases you can just tank the damage. This strategy allows you to keep firing and doing damage for the whole fight. One thing to avoid is shooting the missiles in phase two. You can shoot them down, which means they can soak up gunfire intended for the boss. Aiming away from the missile avoids this. The first priority is to discover an alien nest, which gives me the flamethrower after a two minute countdown. While I do this, I also destroy the western base. I skip the last useful cutscene in the game, because I can work without invulnerability but I can't work while blind. On previous runs I destroyed all the bases and then worked on the nests but I have since found it faster to have one team destroying the bases while another destroys the nests. Another change is using Antaeus' salvos on three nests instead of on the eastern Cabal base. A third change is leading the charge with a Salamander + Scalpel instead of Hornet + Arclite. None of the bases have serious ground defenses, so I can kill the anti air turrets and then continue to assist my choppers by shooting stuff. It is not strictly necessary to destroy the alien base, but it does mean all the walkers will run back to defend it so I can kill them. Otherwise they kill my units when I start burning down the nests. What a horrible mission. It starts off nicely, destroying a base and getting two Sentinels to the dock ASAP. Then things get slow. The truck drivers start by taking their union coffee break before setting off. Once they set off, they follow a series of pathnodes to the dock, and pushing them too far will make them turn back and drive toward the node they missed. I have not found a way to airlift them either. Another issue is debris on the road, which the trucks usually get stuck behind. There are two specific wrecks I have to remove every time, but there is a risk that some flyer will land on the road and hold them up long enough to end the run. Then we have to wait for ten minutes. This was actually a bit more exciting than I was expecting because I accidentally ordered Korolev back to Antaeus without realising until the bugs spawned. I further screwed up by ordering everyone else to follow her and flying her back, when everyone except her was still near the dock and could have made a start on the bugs while she was flying back. Nonetheless, I managed to survive, it didn't cost me time, and I spent less time sitting around waiting for the timer to run down. When I first started planning this I had a really clever way of beating this mission, where I would sneak into the alien base with a Puma, use Antaeus' guns to destroy the air factory, fend off a few flyers attacking Antaeus then bring a Salamander + Warhammer to a spot north of the base and shell it with impunity. It turns out that you can do a direct attack, which is harder to do but much faster. The main reason why my attack works is that the aliens send all their troops to fight the Cabal, and they are not smart enough to pull units out of combat to fight a more important battle. So I only fight what their factories are producing. Actually protecting the Cabal is not an issue, because the aliens take upwards of half an hour to destroy the Cabal town even if you do absolutely nothing. Damaging the derricks will spawn a lot of defensive structures. They will generally wipe you out if you try to ninja the derricks, which is still a way to win but not fast. But if you first destroy the base and the anti air towers they are manageable. Some defensive structures do not need to be destroyed to finish the mission. The ones that spawn when you attack the derricks must be destroyed, but the anti air towers around that area are not required. This is a surprisingly straightforward mission with little to say about it. I just put my troops in follow mode, disable any towers and lead them around so they destroy everything. Anyone who thinks the Arclite is useless should watch this. While the cloak unit naturally encourages stealthy, hit and run tactics, it is actually a lot better to uncloak at the start and shoot everything that comes after you. The reason for this is that most of the buildings spawn when you reach a certain amount of energy, including the derricks in the north west, which spawn when you have about 1000EJ. Until then, it's just you and the standing forces, and once they are dead you don't have to spend much time hiding. A little trick you can do with the Behemoth is to start harvesting, then select another target so you can shoot at the same time. This mission gives us not one but three alien bases, and oddly enough none of them are in the same place that the one in mission 18 was. They all have a decent quantity of forces defending them, but the first two have anti air towers that are rather vulnerable to stealth tactics. The third base is vulnerable to spawn camping, it spawns when the Behemoth is sampled making it fairly easy to control. In case you are wondering, yes, I am blindly placing the waypoint at the start. I don't have any dots drawn on my monitor or anything, but most of the time I can get it on the hill with the scrap. I do check though. All you need to do in this mission is destroy the three power sources. Antaeus has 4 salvos on this mission, which is enough to destroy 2 of them, while the third can easily be destroyed by a direct attack. None of the power sources are well guarded either. Discovering the disassembler cannon is not necessary, I just happened to fly past it. And now, for the grand finale, a . . . fixed time mission. As with other fixed time missions, the key is to build what you need as fast as possible and then survive. In this case, we need a Sentinel with a Scalpel to kill flyers, a Sentinel with a Warhammer to kill ground based units that can fire from outside a Scalpels' range, and a Vulture with a Warhammer to completely break the mission. Putting a Warhammer on flying units seems to be intentionally nerfed by making the shells fall down instead of hitting distant targets. The Vulture however, can fly above the range of anti air towers and bomb key targets. The shell flies directly down, and it is easy to line up on targets with the radar. The key targets I bomb are derricks and energy storage, which go down much faster than factories. It has become a habit of mine to goof around in the last few seconds by manouvring my Vulture over Antaeus and bombing my own guys in the cutscene while they are invulnerable. Unfortunately, my Vulture got destroyed and I looked silly.